For the record, the Cats have now posted three consecutive very strong performances since their inexplicable loss at Auburn 2 weeks ago. The last two games, against Vanderbilt and Missouri in Rupp Arena represented back to back season bests for this team. On Saturday evening, the Cats will venture into the Phog in Lawrence, Kansas to find out if their new found surge to high performance levels can be sustained in a hostile environment against one of the Marquee college basketball programs of all time. Kansas and Kentucky share a long, rich basketball history. Dr. Naismith created the game and coached at Kansas. Phog Allen was a legendary Coach. Coach Rupp played basketball at Kansas and became a legendary coach at Kentucky. 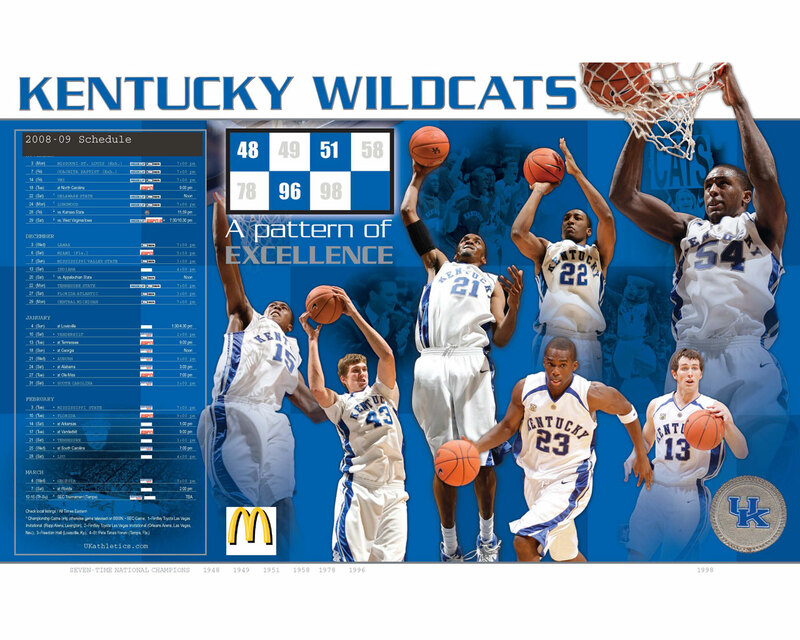 The teams have played many times, at Lawrence, in Lexington, and on neutral courts. There was a span of time when the teams played the UK home game at Freedom Hall. Overall, the Cats hold a 21-7 advantage over the Jayhawks including a rare 7-4 advantage over them in Allen Fieldhouse where they have seldom lost, and where few teams can claim a winning record over them. Kentucky and Kansas played in Lawrence on December 10, 1977, the night that Adolph Rupp passed away, and the Cats honored Coach Rupp with a 73-66 win. I had the great pleasure of traveling to Lawrence to see this game on December 10, 1983 when the Cats beat the Hawks 72-50 on the strength of Jim Master's 10-13 shooting, 23 points as he single-handily silenced the Kansas faithful. Cat fans may recoil from my view of Allen Field House, and Kansas basketball as heresy, but I left my experience at Lawrence with a belief that I continue to hold 32 years later that Allen Field House is the most exciting college basketball venue of any. It is loud. It is knowledgeable. It is historic. It is truly unique. It is special. My wish for this team is to get out of Allen Field House with another UK win over Kansas. In the litany of this series, many UK teams have done just that. Coach Rupp did it twice (1960 and 1972). Coach Hall did it five times in six trips. However, no UK coach has gotten a win in this building since that game when Jim Master was simply Masterful. However, Coach Calipari is 3-0 against the Jayhawks as UK's coach. Kansas brings a 16-4 record into this Big12-SEC showdown matchup with the Cats, who also sport a 16-4 record. Kansas has suffered losses t #7 Michigan State by 6 in November, at #6 West Virginia by 11, at #68 Oklahoma State by 19, and at #11 Iowa State by 13. Kansas claims wins over #1 Oklahoma by 3 in triple OT, #25 Baylor by 28, #31 Vanderbilt by 7. In addition to Vanderbilt, Kansas and Kentucky have both played #67 UCLA. Of course, the Cats fell at UCLA while Kansas defeated the Bruins by 19 on a neutral court. KANSAS has played its first 20 games at an average tempo of about 72 to 73 possessions per game, scoring 82.1 ppg (1.131 ppp) and allowing an average 69.1 ppg (0.955 ppp). KANSAS has turned the ball over on 16.2% of its possessions while forcing turnovers on 19.1% of opponent possessions. On the Boards, KANSAS has secured an offensive rebounding rate of 31.2%, and a defensive rebounding rate of 73.8%. In contrast, the Cats have averaged about 70 possessions per game, producing 77.9 ppg (1.115 ppp) and allowing 66.4 ppg (0.942 ppp). The Cats have committed turnovers on 17.5% of its possessions and forced turnovers on 19.1% of opponent possessions. On the Boards, the Cats' rebounding rates have been 39.8% and 70.1% on the offensive and defensive ends. Based on this distribution, the analysis tips in favor of Kansas by 8 points, 78-70 in a game played at a pace of 71 possessions for the Cats and 72 possessions for Kansas. Pomeroy figures the Game in Kansas' favor by 6 points, 78-72 at a pace of 70 possessions. Vegas opened this evening with the Jayhawks favored by 5 points. 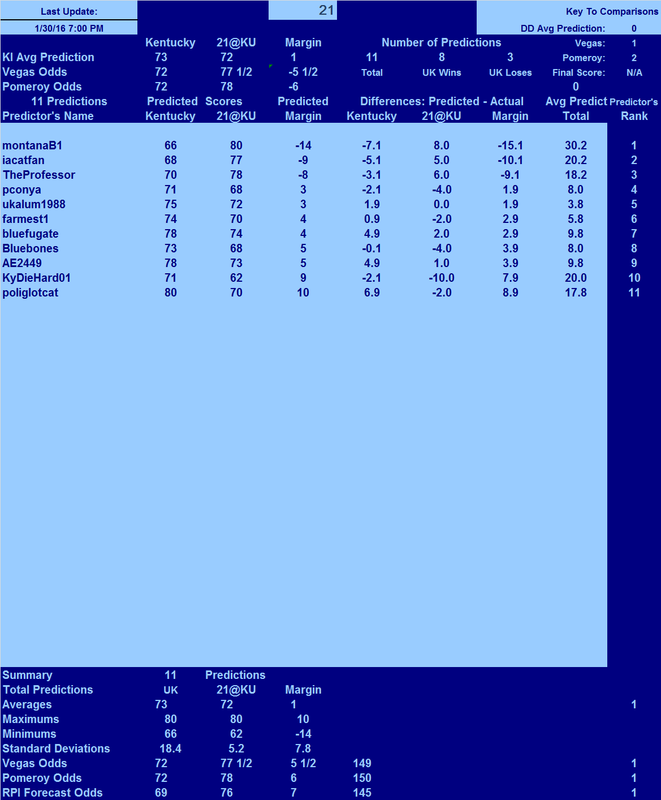 Coming back to the roller coaster theme as compared to the possibility of a surge occurring, if this team sustains its recent surge, the final margin is likely to be 10 or more points above the predicted average margin, swinging this from a single digit loss for the Cats to a single digit win for the Cats. Coach Calipari starts Isaiah Briscoe, Derek Willis, Alex Poythress, Tyler Ulis, and Jamal Murray. Dominique Hawkins may not be available for the game tonight. Kansas controlled the opening tip, and wasted no time getting to the rim for a layup. The Cats answered with a pair of free throws by Isaiah Briscoe, but Kansas edged back into the lead with their second layup basket. Following an offensive rebound, Isaiah Briscoe was fouled and then assessed a technical foul. After all the shooting ended, Kansas held a 5-4 lead and the ball. The Cats moved on top with a layup by Tyler Ulis, and following a 3 pointer by Kansas, Derek Willis provided UK's answer with a 3 pointer. At the under 16 media timeout, the Cats hold the early lead, 11-8. In the second segment, the Cats maintained their lead except for a brief time when Kansas regained the lead, 16-15, but Jamal Murray hit a 3 pointer from the left wing to lift the Cats back into the lead at the under 12 media timeout, 18-16. At the timeout, Dominique Hawkins reported into the game for his first action since sustaining his high ankle sprain. In an extended third segment, the teams exchanged the lead several times, with the Jayhawks holding a 2 point lead at the under 8 media timeout, 27-25 with 6:11 remaining in the first half. In the short 4 th segment, the Cats get one basket on three possessions, and Kansas gets 6 points out of their 4 possessions to stretch their lead to a game high 6 points, 33-27 prompting Coach Calipari to take a timeout with 4:05 remaining. In that segment, the Cats failed to get decent shots on consecutive possessions, settling for bad 3 point attempts rather than drive the ball into the paint. Over the last 4 minutes, the Cats take control of the game, moving from 6 down to up by 6 at the half, 46-40. The Cats finished on a run of 19-7. Kentucky scored 46 points on 39 possessions (1.18 ppp) while KANSAS scored 40 points on 39 possessions (1.03 ppp). The Cats shot well for most of the half, and a strong start and strong finish, lifted them to 17-27 (63.0%) including 4-10 (40.0%) from long range. KANSAS shot the ball well also, 15-27 overall (55.6%) which included 2-8 (25.0%) from long range. From the line, the Cats were 8-11 (72.7%) while KANSAS was 8-12 (66.7%). The Cats committed 7 turnovers, one for each 5.6 possessions, and the Cats forced KANSAS into 11 turnovers, one for each 3.5 possessions. On the boards, the Jayhawks won the battle 16-10 and the Jayhawks won the battle on the offensive glass 5-1. The Cats converted their 1 second chance opportunities into 2 second chance points while KANSAS used their 5 second chances to score 2 second chance points. 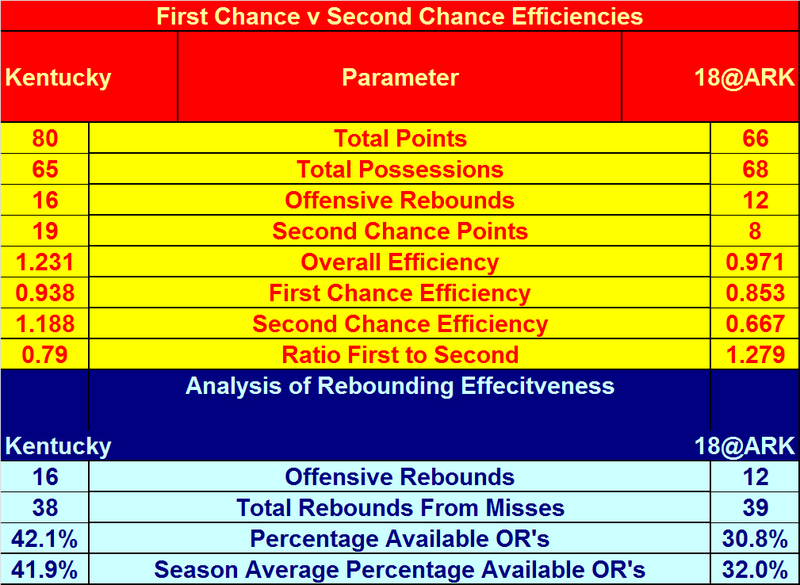 KANSAS had an efficiency of 0.97 ppp on its 39 first chance possessions and 0.40 ppp on its 5 second chance possessions. 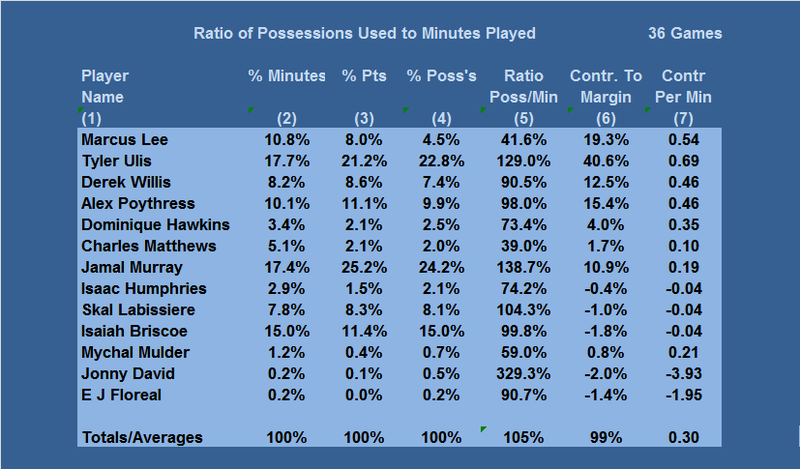 Kentucky had an efficiency of 1.13 ppp on its 39 first chance possessions and 2.00 ppp on its 1 second chance possession. The Cats grabbed 8.3% of its misses and KANSAS grabbed 35.7% of its missed shots in the first half. The Cats open the second half with a jump shot by Tyler Ulis to extend their lead to 8 points, but Kansas responded with a pair of 3 pointers to trim the lead to 3 points, 52-49 at the under 16 media timeout. After the timeout, Marcus Lee makes a basket on a high-low feed from Isaiah Briscoe, and Marcus Lee gets an offensive rebound dunk, forcing Coach Self to call a timeout with his Jawhawkds down by 7, 56-49. After the timeout, the Cats manage to extend the lead to 8 points, but back to back baskets by Seldon trimmed the lead back to 4 points, 57-53, and Coach Calipari takes a timeout with 12:46 remaining in the game. Neither team scores following the UK timeout leading to the under 12 media timeout with 11:50 remaining in the game. In the third segment, the Jayhawks continue to chip away at the Kentucky lead, cutting it to a single point, 64-63, at the under 8 media timeout with 7:30 remaining in the game. Kansas will have the ball after the timeout. Kansas finally moves back into the lead, 66-64 with 6 minutes remaining in the game. At the under 4 media timeout, Kansas leads by 1 point, 69-68, and will have a pair of free throws after the break with 3:18 remaining in the game. After Kansas missed both free throws, Tyler Ulis drove for a difficult basket to lift the Cats back on top by 1. Following a Kansas offensive rebound dunk, Skal Labissiere made a jump shot from the free throw line to give the Cats another 1 point lead, 72-71, with 2:00 remaining in the game. Clock expires with the score tied 76-76. We have overtime. The Cats control the tip, but turn the ball over. Kansas eases into the lead on a pair of free throws with 3:46 remaining. Kansas wins the game at the free throw line in the OT period 90-84. 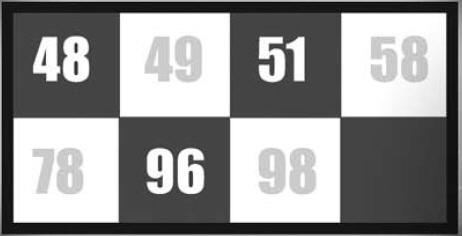 UK scored its 84 points on 83 possessions for the game, and KANSAS scored its 90 points on 81 possessions. The Jayhawks controlled the Boards, 42-31, and Kansas won the battle on the offensive glass 14-6. Kentucky used its 6 second chance possessions to score 10 second chance points, and KANSAS used its 14 second chance possessions to score 10 second chance points. 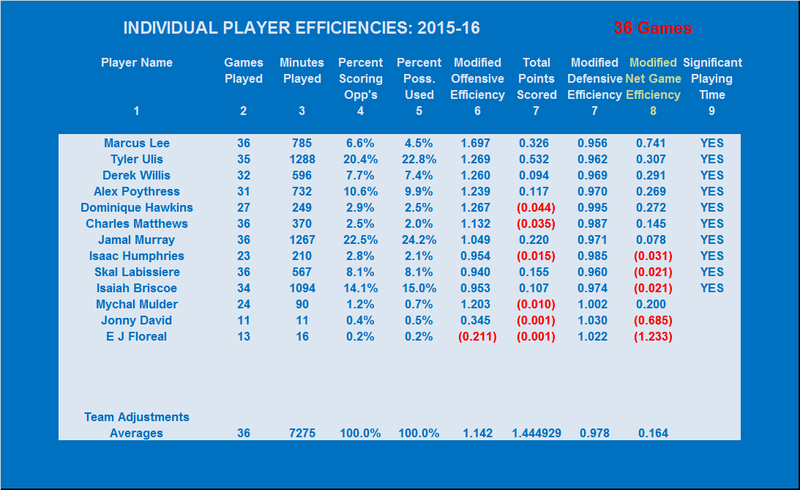 KANSAS had an offensive efficiency of 0.988 ppp on its 81 first chance possessions and 0.714 ppp for its 14 second chance possessions. UK had 0.892 ppp on its 83 first chance possessions and 1.667 ppp on its 6 second chance possessions. With respect to the offensive rebounding, UK grabbed 17.6% of its misses as offensive rebounds while KANSAS was able to convert 35.9% of its misses into bonus possessions with offensive rebounds. UK hit poorly from the free throw line in this game, making 13-22 [59.1%]. KANSAS made 30-47 [63.8%] for the game. Field goal shooting for UK was 33-62 overall [53.2%] and 5-23 from long range [21.7%]. For KANSAS, their field goal shooting from inside the arc was a 18-39 [46.2%] and from long range, KANSAS hit 8-17 [47.1%]. The Cats committed 16 turnovers, one for every 5.2 possessions. The Cats forced 15 KANSAS turnovers, one for every 5.4 possessions. Next Game On Schedule: Tuesday evening at Tennessee in the 22 nd regular season of the 2015-16 season .